Prepare meat according to taco seasoning packet instructions. Once prepared, set aside. Lay warm tortilla out flat. Heat the nacho cheese. Spread 1/4 of the nacho cheese sauce (less if you are not a fan) onto the tortilla leaving space around the edges. Spoon 1/4 of the prepared beef down the middle of the tortilla on top of the nacho cheese and beans. Sprinkle with 1/4 the amount of cheese (depending on your love of cheese you might end up using more) on top of the beef. Add a couple dollops of sour cream (again depending on how much you like). Roll up sides and serve warm. When asked what my kiddos want for dinner, they either say pizza or fast food. While it is easy, it usually isn’t the best quality and you don't want that going into your families' bodies. Enter DIY Fast Food. As of today, my family doesn't run for the border…. we bring the border to us by making our own 5 Layer Beef Burritos with Old El Paso ingredients. Imagine all the flavor of your favorite (well, my favorite) burrito and you get to control the quality of the ingredients. Light sour cream or even Greek yogurt or even light cheese. You can use the leanest ground beef as well. 1. Prepare meat according to the taco seasoning packet instructions. Once prepared, set aside. Lay warm tortilla out flat. 2. Heat the nacho cheese. Spread ¼ of the nacho cheese sauce onto the tortilla leaving space around the edges. 3. Heat the refried beans. Spread ¼ of the beans on top of the nacho cheese sauce. 4. 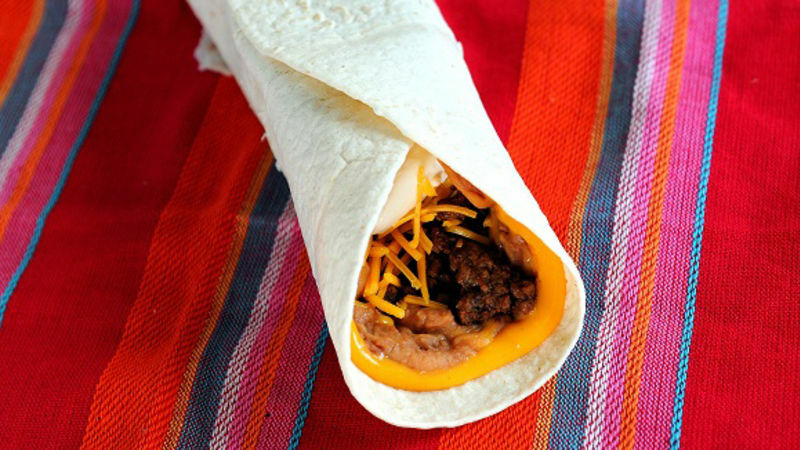 Spoon ¼ of the prepared beef down the middle of the tortilla on top of the nacho cheese and beans. 5. Sprinkle with ¼ the amount of cheese (or more) on top of the beef. 6. Add a few dollops of sour cream (depending on how much you like). Now will it replace the 2 a.m. run for the border after a night out at the bar? No, because no one should be cooking then. But it can replace dinner time trips for fast food.